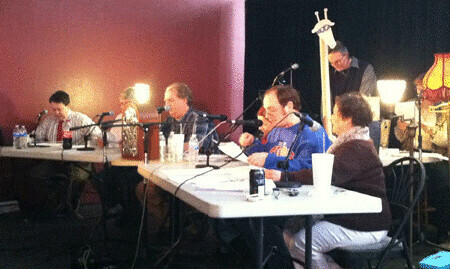 Swann Song wrapped up its run at the Farmland Center this past weekend and I’m happy to report it was a major success! I just want to take a moment to thank the amazing cast who took my simple words and used them to create such rich, believable characters on stage. Thank you, Judy Cole, Rita Wessel, Jerry Cole, Hannah Kirkpatrick, Sean Orlosky, Bob Green, Judy Oakerson, Geoff Witt, and Kevin Cole! They all gave substance and heart to the show night after night. They are truly the best! More thanks to Darrin Murrell for taking a chance on a neophyte, Stevie Hahn for all his technical support, and Judy and Jerry Cole for being such great collaborators and for providing the Sunday dinners. Finally, a big thank you for everyone who attended Swann Song and made it such a success! You all have made me so proud and very happy. Thank you! 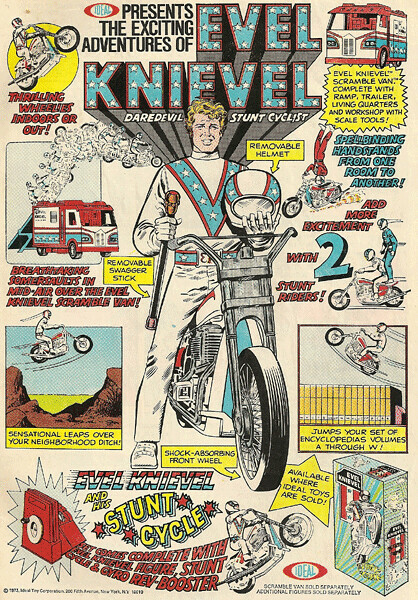 My Comic Book Collection: Where's My Swagger Stick? Adventure Time #13 Dial H #10 Hellboy in Hell #4 The Unwritten #46 Bought at Bob's Comic Castle. Total cost: $13 and change Note: Finally sampled the off-beat Dial H and I enjoyed it. Awesome cover from Brian Bolland. Swann Song opened last night and I heard it had a great opening night. I'm a proud Papa! Stale waffles make lousy snowshoes. One of these days I'm going to draw every one of the background cab drivers on Taxi just to prove that I can. Group hugs are lame if your stuffed animals don't hug back. I'm often afraid my Captain Caveman and The Teen Angels fanfic will never get the attention it deserves. You know what modern horror movies are missing nowadays? Angry villagers with torches. 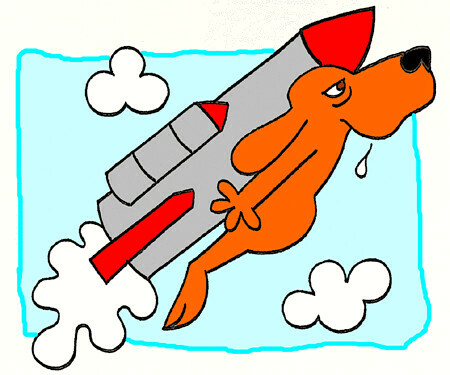 Tempted to write a children's book called Baby Skunk's Fresh Diaper to answer the eternal question: What swells worse? A skunk or skunk poop? 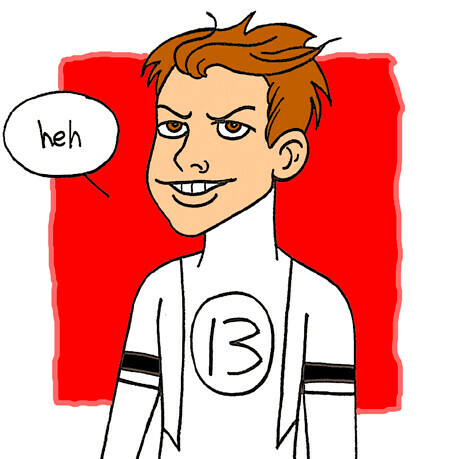 I'm also tempted to jump on the Tumblr bandwagon because all the cool kids seem to flock there. Last week I came across a kid named "Brady Bunch". Parents can be so cruel! 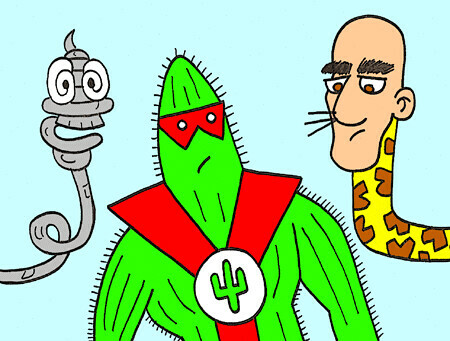 Dale Martin's The Human Spring, Keith O'Brien's Captain Cactus, and John Oak Dalton's Giraffe Man! I just brought them together for the first time. FF #4 Legion of Super-Heroes #17 Simpsons One-Shot Wonders: Professor Frink Purchased at Bob's Comic Castle. Total cost: $10.67 Note: Yay! Keith Giffen is back on Legion! I can't wait to see...What? He's only doing this issue? Never mind...Oh, and FF was this haul's clear winner! 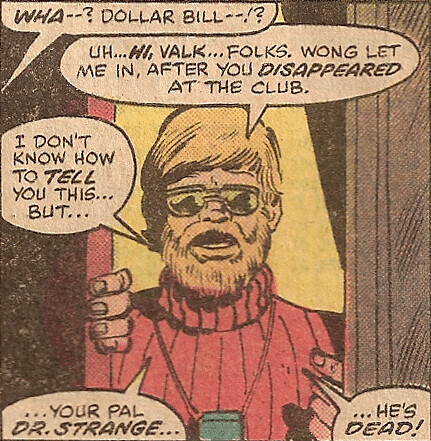 Dollar Bill has some bad news from The Defenders #59 (May 1978)! Words/colors by David A. Kraft, words/pictures by Ed Hannigan, finished art by Dan Green, and Joe Rosen is the letterer. Marvel Comics. Dollar Bill was created by David Anthony Kraft and Keith Giffen. Hey, let’s recap the last couple months! This January wasn’t a great month to start the new year on. Things at work were slow and uncertain. Six hour days and often working four days a week meant I used up most of my PTO time (Paid Time Off, natch) to cover for my missing hours. Since my chances for working more hours rested on me remaining on second shift, I had to reluctantly drop out of the cast for The Odd Couple at the Muncie Civic. On the plus side, I did work on my first full length show, Swann Song, all through January with help from my friends, Jerry and Judy Cole. 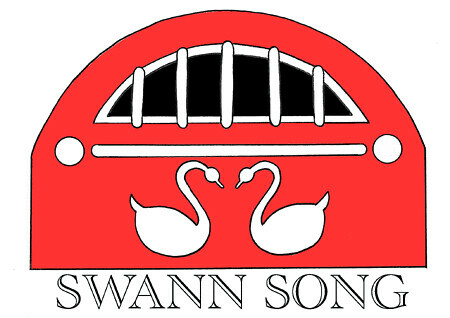 By the end of the month, Swann Song was completed. Work has gradually picked up and things felt more hopeful for some reason. With Swann Song done, I have to admit I slacked off creatively with no minor or major project attempted. Fortunately, bad winter weather has spared us so far in East Central Indiana. I did get sick for a couple days just recently, but I feel fine at the moment. Here’s some good things to look forward to: 1) Swann Song opens March 8 at the Farmland Center for a three week run and 2) Tom Cherry’s Old Time Radio Show returns on March 23! Now I just need to get started on some new radio scripts!